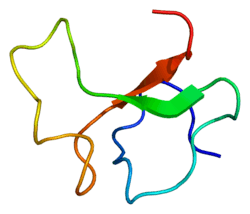 Insulin-like growth factor-binding protein 5 is a protein that in humans is encoded by the IGFBP5 gene. ↑ Allander SV, Larsson C, Ehrenborg E, Suwanichkul A, Weber G, Morris SL, Bajalica S, Kiefer MC, Luthman H, Powell DR (May 1994). "Characterization of the chromosomal gene and promoter for human insulin-like growth factor binding protein-5". J Biol Chem. 269 (14): 10891–8. PMID 7511611. Mohan S, Farley JR, Baylink DJ (1996). "Age-related changes in IGFBP-4 and IGFBP-5 levels in human serum and bone: implications for bone loss with aging.". Prog. Growth Factor Res. 6 (2–4): 465–73. doi:10.1016/0955-2235(95)00027-5. PMID 8817691. Schneider MR, Wolf E, Hoeflich A, Lahm H (2002). "IGF-binding protein-5: flexible player in the IGF system and effector on its own". J. Endocrinol. 172 (3): 423–40. doi:10.1677/joe.0.1720423. PMID 11874691. Firth SM, Baxter RC (2003). "Cellular actions of the insulin-like growth factor binding proteins". Endocr. Rev. 23 (6): 824–54. doi:10.1210/er.2001-0033. PMID 12466191. Shimasaki S, Shimonaka M, Zhang HP, Ling N (1991). "Identification of five different insulin-like growth factor binding proteins (IGFBPs) from adult rat serum and molecular cloning of a novel IGFBP-5 in rat and human". J. Biol. Chem. 266 (16): 10646–53. PMID 1709938. Ehrenborg E, Vilhelmsdotter S, Bajalica S, et al. (1991). "Structure and localization of the human insulin-like growth factor-binding protein 2 gene". Biochem. Biophys. Res. Commun. 176 (3): 1250–5. doi:10.1016/0006-291X(91)90420-C. PMID 1710112. Andress DL, Birnbaum RS (1991). "A novel human insulin-like growth factor binding protein secreted by osteoblast-like cells". Biochem. Biophys. Res. Commun. 176 (1): 213–8. doi:10.1016/0006-291X(91)90911-P. PMID 1850257. Kiefer MC, Ioh RS, Bauer DM, Zapf J (1991). "Molecular cloning of a new human insulin-like growth factor binding protein". Biochem. Biophys. Res. Commun. 176 (1): 219–25. doi:10.1016/0006-291X(91)90912-Q. PMID 1850258. Ilvesmäki V, Blum WF, Voutilainen R (1994). "Insulin-like growth factor binding proteins in the human adrenal gland". Mol. Cell. Endocrinol. 97 (1–2): 71–9. doi:10.1016/0303-7207(93)90212-3. PMID 7511544. Kou K, James PL, Clemmons DR, et al. (1994). "Identification of two clusters of mouse insulin-like growth factor binding protein genes on chromosomes 1 and 11". Genomics. 21 (3): 653–5. doi:10.1006/geno.1994.1329. PMID 7525452. Nam TJ, Busby W, Clemmons DR (1997). "Insulin-like growth factor binding protein-5 binds to plasminogen activator inhibitor-I". Endocrinology. 138 (7): 2972–8. doi:10.1210/en.138.7.2972. PMID 9202242. Twigg SM, Baxter RC (1998). "Insulin-like growth factor (IGF)-binding protein 5 forms an alternative ternary complex with IGFs and the acid-labile subunit". J. Biol. Chem. 273 (11): 6074–9. doi:10.1074/jbc.273.11.6074. PMID 9497324. Zheng B, Clarke JB, Busby WH, et al. (1998). "Insulin-like growth factor-binding protein-5 is cleaved by physiological concentrations of thrombin". Endocrinology. 139 (4): 1708–14. doi:10.1210/en.139.4.1708. PMID 9528953. Twigg SM, Kiefer MC, Zapf J, Baxter RC (1998). 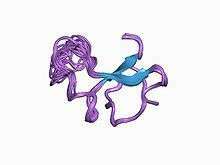 "Insulin-like growth factor-binding protein 5 complexes with the acid-labile subunit. Role of the carboxyl-terminal domain". J. Biol. Chem. 273 (44): 28791–8. doi:10.1074/jbc.273.44.28791. PMID 9786878. Kalus W, Zweckstetter M, Renner C, et al. (1999). "Structure of the IGF-binding domain of the insulin-like growth factor-binding protein-5 (IGFBP-5): implications for IGF and IGF-I receptor interactions". EMBO J. 17 (22): 6558–72. doi:10.1093/emboj/17.22.6558. PMC 1171003 . PMID 9822601. Ständker L, Wobst P, Mark S, Forssmann WG (1999). "Isolation and characterization of circulating 13-kDa C-terminal fragments of human insulin-like growth factor binding protein-5". FEBS Lett. 441 (2): 281–6. doi:10.1016/S0014-5793(98)01497-5. PMID 9883900. Kecha O, Martens H, Franchimont N, et al. (1999). "Characterization of the insulin-like growth factor axis in the human thymus". J. Neuroendocrinol. 11 (6): 435–40. doi:10.1046/j.1365-2826.1999.00343.x. PMID 10336724.